Apparently I should have learned a little more at seminary. If only…. My brother, sister-in-law and their two girls were here last weekend, for a long weekend. It had been 18 months since I’d seen them and, of course, the girls had grown. It’s always hard to be around kids that young. Well, not always. Almost always. Because kids aged 5 and younger (and these two are 4 and 2) were born since Jim and I began trying to have kids. But this visit was good. Hard, but good. Good for me to get to know the girls, and them to get to know Jim and me, so that we’re not just an aunt and uncle in photos alone. They live overseas, so it’s not often we see them. And I’m thankful for that time. This past week brought a tragic death, a 40-something year old daughter of the church, sister to several members, mother of a 15-year old. Heart attack. It was, and continues to be a living nightmare, and my thoughts are never far away from this extended family. It’s painful, and so awful for this family. My prayers are for strength for the 15-year old, and the mother of the one who died. My prayers are for the husband, bereft, stunned, left feeling alone. My prayers are that we all appreciate our families and friends more. Of interns, Cubs, rabbits, etc. It’s been hot. I shouldn’t complain, because some places are hotter than this, but it’s been hot enough that each day we shut the house up (shut windows, pull the shades) and hang out downstairs. We’re fortunate to have a downstairs to hang out in, though. Our seminary intern , Jen, arrived last week. She’s here for the summer, to get pastoral intern experience. It should be a good, and busy, summer. Lots going on. Being in a small church is such a great experience, yet also a bit confusing at times, because one’s schedule is so random. Church is excited for her time here, and we are too. Monday we went to the Cubs/Astros game with Jen and Charlie, a guy from church. Such a blast! First of all, the Cubs won (yeah! 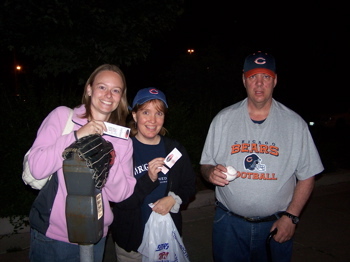 ), second, Carlos Zambrano hit a home run… a pitcher!, and third, we got an autograph! Charlie really wanted to have a baseball signed, so we stood around waiting… Cesar Izturis walked by, but we didn’t recognize him, so missed him… but then we were mistakenly told that Felix Pie was there… we were so excited, because Felix is my new Cubs man. (don’t worry: Jim knows about this. Every year I have at least one Cubs “man”.. who I like to follow.) But, it turned out to be Carlos Marmol. But hey, not everyone gets their Cubs ticket signed by relief pitcher Carlos Marmol! Then Charlie saw someone else across the way, and got an autograph from Ted Lilly. He was really happy when he found out Ted Lilly was the one kicked out of the Atlanta game because he hit Renteria with a pitch. Tuesday was our monthly district meeting. For those who don’t know, a “district” in this context is a group of Covenant clergy within a certain geographical area. Our district is Wisconsin (part of WI) and Libertyville, IL.. so we call ourselves “The Badger District + Dwight”. (Dwight is pastor of Libertyville.) It’s the best district…. really. Normally we meet in Milwaukee and share, eat, pray. Summer is a bit more casual. On Tuesday we met at Covenant Harbor, and after a delicious lunch at GBC, we went on the pontoon boat. As hot as it’s been, evenings have cooled down a bit. Enough that the other night, several friends were over for a hot tub party. Hanging out in the hot tub, talking family, seminary, theology, monasteries, dogs…. it’s moments like these that I’m so glad we have a hot tub, and even more thankful for friends. My brother, sister-in-law and their two girls arrived late last night. They live in Taiwan, so we don’t see them often. So far Abby has let them sleep, and hasn’t barked too much down the stairs, though she is keeping a close watch on the stairway, in case they wake up soon. Two years ago, I was crying on the phone with my mother, about how God has forsaken me in this infertility journey. My mother’s response was, “Cathy, is God only good when you get what you want?” Well, obviously, the answer is “no.” God is good—all the time, right? That’s what I want to believe. Yet, don’t we often hear/say the following statements, after people have a great experience, or a difficult experience-turned-wonderful? : “God was so good”… “God helped me through that.”…. “God’s goodness was so evident to me, as he gave me the strength to cope.”… And then, when I state my doubt in God’s goodness, or when I express my feelings of frustration and abandonment from God, people respond in frustration and disbelief: “But God is so good, if you only look for his goodness!” And often, they put it on me. If only you’d pay attention, Cathy. If only you’d spend more time in prayer, stop worrying about the future, focus on the good you do have in your current life situation, praise God in all situations, etc… And there is some truth to this. On one hand, the responsibility is on me to seek God’s goodness despite feeling forsaken by the omnipotent God. And I accept that I am not always willing to do this, because the pain is too great, and experience has taught me that hope, even in God, leads to disappointment. On the other hand, I think that for so many of us, this is the Christian math we speak, whether we realize it or not: I pray for something + God answers my prayer = God is good. OR… I pray for something + it doesn’t happen + I pray again + God at least answers part of my prayer, by not making other situations worse in life = God is good. That’s Christian math as I have heard it and, in the past, spoken it. But in my experience, (and though I don’t claim to speak for others, I know that others struggling with years of unanswered prayers feel similarly) the reality of Christian math goes like this: I pray for something + it doesn’t happen + I pray harder + it happens to others all around me and I have to be simply grin and bear it + I pray again + God draws out the painful situation, and allows other difficulties to be thrown in at the same time + I keep praying, including prayers for strength to cope + my prayer request is once again answered in someone else’s life… = God is good? The fact is, God is good. We need to proclaim God’s goodness in all situations. And I don’t want to be a fair-weather Christian, only content with God when things go her way. But it’s hard. And to those of you who don’t comprehend ever questioning God’s goodness, please, for the sake of those in your life who understand it better than they want to, please try. Please understand that Christian math does not always turn out as we like to think it does… and that when it doesn’t, it’s not easy to proclaim “God is good”, especially when surrounded by those who have exactly what you’ve been praying for. Please understand that each milestone, year, anniversary, and reminder of what has been withheld from you makes it that much more difficult. Please understand that feeling this way—questioning God’s goodness, feeling abandoned by God—can be more agonizing than the original pain. I did it! I preached three weeks in a row. For those of you who preach every week, this accomplishment might seem a bit ridiculous, for a pastor. But Co-pastoring with my husband, and being a pastor who has a love/hate relationship with preaching, I have never done that before. I preach often, but never three in a row. Because of my love/hate relationship with preaching, it’s an exhausting process for me, though also enjoyable. But I’m tired, and ready for my break, now! For a little bit. Today being Trinity Sunday, I appropriately preached on the Trinity. 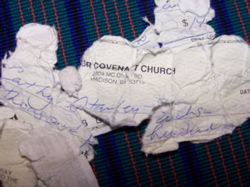 And as a fun part of my illustration, I used this photo, as well as the real deal, up in the pulpit with me. Don’t worry, I preached a serious, theological sermon about the nature of Father, Son and Holy Spirit. But how could a preacher resist sharing the “Lego Trinity”, with a congregation? The “Lego Trinity” was a gift from Sandie and Dave, some months ago.. another addition to my “Jesus Junk” collection. Thanks, guys! I loved having the Lego Trinity with me in the pulpit today. The week ahead is a busy one. Full of some fun events, and some challenging ones. I see the sleep doctor, I will hopefully get lots of sleep in the meantime, and I hope to get a lot of de-cluttering done at home. A little (or a lot) church website work, so we can finally launch our new site… and our intern, Jen, is coming to town. Should be an interesting, and hopefully great, week. I know, they’re “just pets”. But to us animal lovers, dogs really are friends. Companions, entertainment, exercise partners, joy-bringers, everyday… Yesterday was a sad day in our lives, as Emily, friends’ golden retreiver, died. Emily was Abby’s first canine friend in Madison, (in the photo, Emily’s on the right) and they were so incredibly adorable together. Emily was honestly the sweetest dog I have ever met. She would have been 14 next week, but was getting worse and worse.. not eating, drinking, etc. We went to say goodbye to her yesterday morning, and when we came home and saw our dogs I burst out crying. When I went to bed last night, I had tears in my eyes, as I thought about how lonely our friends’ house must have felt on the day their dog died. And I gave thanks for our dogs (dog and “foster dog”), and for Emily. May you have endless amounts of tennis balls to chew in heaven, Emily! (yes, I believe dogs go to heaven.) We miss you.